When another friendly creature in this lane dies, draw a card. Disciple of Namira is an epic Endurance creature card. It is part of the Core Set. "I love to play with dead things!" "I will cut you ear to ear!" 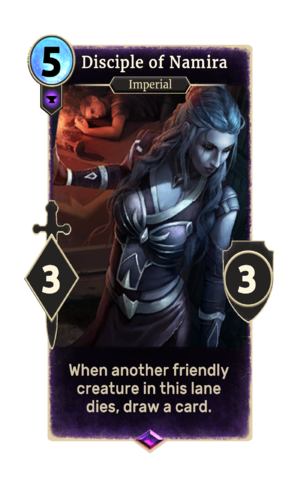 The card is named for Namira, one of the Daedric Princes. This page was last modified on 16 February 2019, at 13:30.